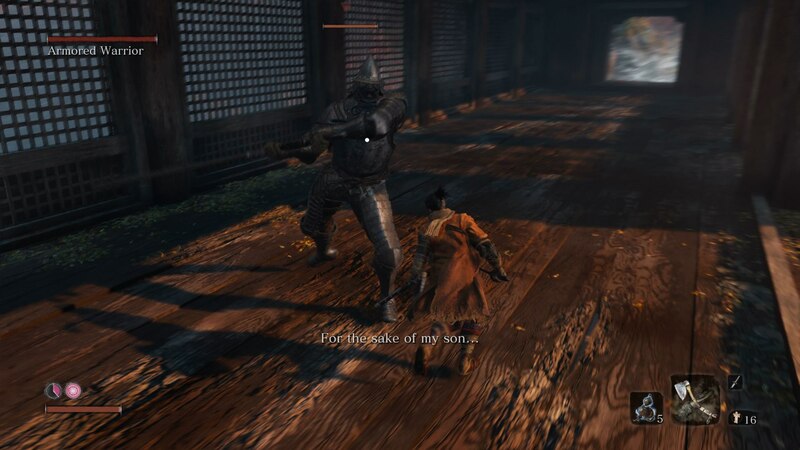 The Armored Warrior is one of the many bosses in Sekiro: Shadows Die Twice. Here's how to defeat them. The Armored Warrior of Shadows Die Twice waits for you atop a bridge in the Senpou Temple region of the game, and he's tough to beat. In our Sekiro Armored Warrior guide, we'll be detailing how to beat the Armored Warrior in Sekiro as easily as possible. If you're just here for the absolute essential tips on how to beat the Armored Warrior, then check out the list below. Parrying the attacks of the boss can significantly damage your Posture meter. Try dodging round to the right of the warrior, and laying into him as he's turning to face you. The Firecracker Prosthetic can be really good for temporarily staggering him. Your goal is to damage his health first, to make it easier to raise his Posture meter to the maximum. 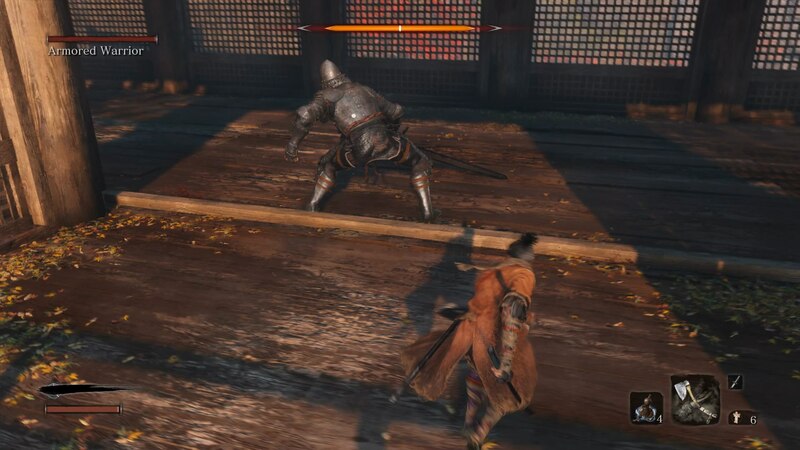 When you fight the Armored Warrior, you'll be doing it on a long bridge in the Senpou Temple area of Sekiro. This can be tricky because of the nature of the arena: you're in a bridge with very little room for moving around, and even less room for error against the Armored Warrior. The Armored Warrior wields a massive greatsword in both hands, so for this boss fight you can forget all about parrying, because nothing's holding back the giant sweeping attacks that the boss can pull off. Instead, your primary method of movement in this fight with the Armored Warrior should be dodging, not jumping or parrying. Because of the nature of the Armored Warrior's sweeping attacks, you want to be dodging and moving to the right, going around him in a counter clockwise fashion. This is because all of the Armored Warrior's sweeping attack go from left to right, so you stand a much better chance of dodging them if you're already moving counter clockwise. You'll notice that in this fight with the Armored Warrior, it's literally impossible to do any damage to his health. Instead, it's the Posture/stun meter that you're going to be damaging in this fight, and getting the warrior's Posture meter to the maximum, and then stunning him to perform a Deathblow, is the only way of killing him. The best tool for this is the Loaded Axe. 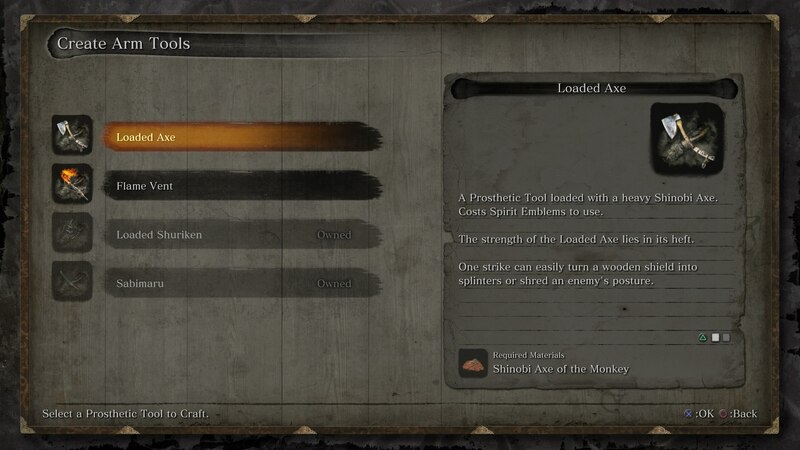 If you haven't yet obtained the Loaded Axe, head over to our Sekiro Prosthetic Tools guide for more. 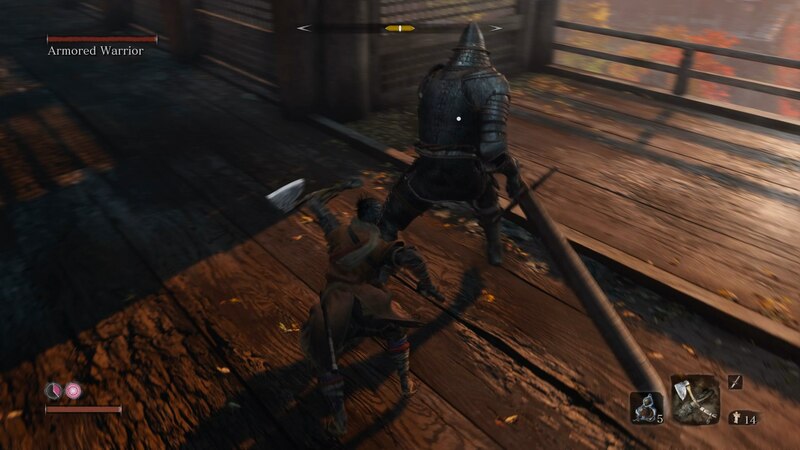 When you've obtained the Loaded Axe for your Shinobi Prosthetic, you'll want to purchase the 'Fang and Blade' Skill for Wolf, which is pretty crucial to this fight. The Fang and Blade Skill allows you to firstly attack wit the Loaded Axe on the right trigger, and immediately follow up with the dual sword/axe attack by pressing the right bumper straight after. The second the Armored Warrior swings and missed you, press right trigger and then the right bumper to execute this chain attack, which is by far the quickest method of attacking his Posture meter effectively. The only main attack that you need to be on the lookout for with the Armored Warrior is when the boss holds his sword in one hand and roars. Immediately put as much distance between you and the warrior as possible, because he's about to chain together a series of slamming attack that you can't block, and can instantly be killed by. For your troubles with the Armored Warrior, you'll gain one Prayer Bead, which can be used to raise your maximum health and Posture. Not a bad reward for a tough boss fight. There's only really one way to cheese the Armored Warrior in Shadows Die Twice. Equip the Loaded Axe as your Prosthetic Attachment, make sure you're bringing the maximum amount of Spirit Emblems possible, and repeatedly lay into him with the Loaded Axe as often as possible, chaining it together with the Fang and Blade Skill if possible. Combine this with the Mikiri Counter when the boss thrusts forward, and you'll easily beat the Armored Warrior.